Jacob Burnell was private in Captain Randolph Pabst Company G of the Flint Regiment of the Michigan Volunteers of the 10th Michigan Infantry for 18 months of service. He enlisted on January 20, 1864. He was 17 years 8 months, but claimed he was 18 years old to join the infantry. He was discharged on July 19, 1865 in Louisville, KY at about age 20. Jacob apparently did not write German or English. According to his enlistment papers he signed with an "X" for his signature. Jacob Burnell would tell stories about the civil war. He and another soldier were lost from their unit; they spotted some Confederate soldiers on horseback approaching. They took cover in a barn nearby, hiding in the hayloft. The southern rebel soldiers entered the barn and tried to locate the two union soldiers by poking in the hay with their bayonets. They gave up looking when they could not find them. Later, Jacob and his friend worked their way back to their outfit. They were outnumbered and far from their command. They used their cunning to escape and return to Union encampment. Jacob Burnell was about 20 years old as noted on his discharge papers. He was in the Campaign of the Carolinas. However on March 11- 13 1865 engaged the Confederates at Fayetteville, NC, crossing Cape Fear River on the 12th March. The regiment skirmished heavily with southern forces at Averysboro, NC. On March 16th fighting heavily with southern forces at Averysboro, NC, the 19th-21st fighting at Bentonville, NC. Michigan 10th marched on Averysborough, Bentonville and Goldsboro, North Carolina. The Tenth then marched to Raleigh, NC on April 10-14, reaching Goldsboro on the 23rd. The line march was then continued to Richmond, VA. The city of Richmond was in Union hands upon the surrender of General Lee’s Army under General Joseph Johnson to General Sherman at Bennett House on April 26, 1965. On May 10th the Regiment was marched to Washington, DC, where it took part in the Grand Review with General Sherman Army on the 24th May 1965. He was possibly in the victory march in Washington DC and discharged in Tennessee to return home to a farmer in Macomb County. On May 23 in a procession that stretched for seven miles as column passed the reviewing stand in front of the White House, where President Johnson, general-in-chief Ulysses S. Grant, senior military leaders, the Cabinet, and leading government officials awaited. On the following day, William T. Sherman led the 65,000 men of the Army of the Tennessee and the Army of Georgia along Washington's streets past the cheering crowds. Within a week after the celebrations, the two armies were disbanded and many of the volunteer regiments and batteries were sent home to be mustered out of the army. 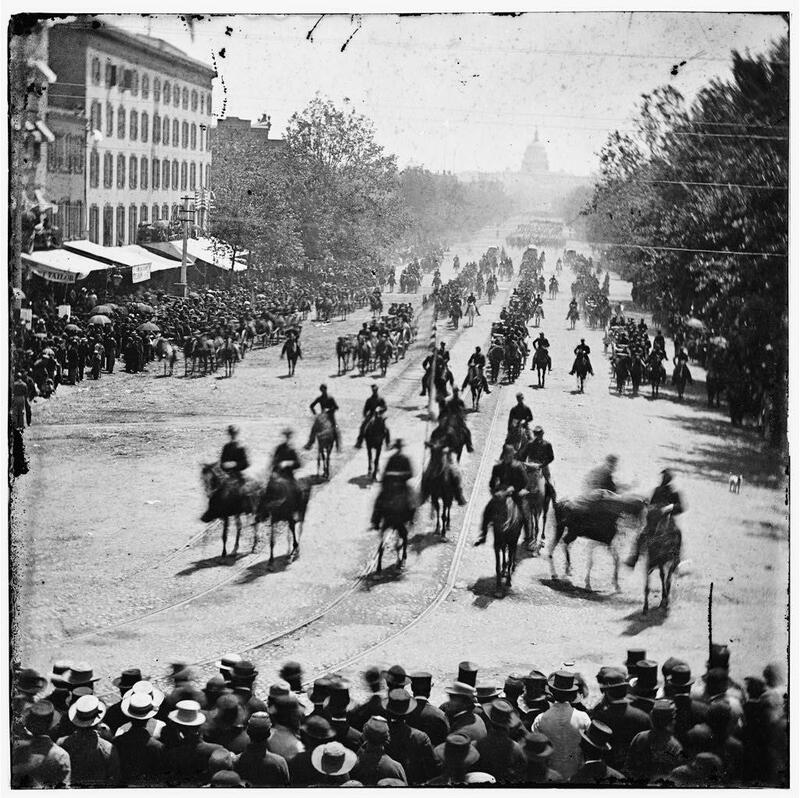 Matthew Brady photos document the passage of the Michigan 10th infantry passing in this parade. He is buried in Memphis, Michigan. Although he is listed with “Soldiers and Sailors” as Jakob Bunnell his name is Jacob Burneauer according to a document found is his National Archive Pension. It is estimated that over 400,000 immigrants served with the Union Army. This included 216,000 Germans-born soldiers fought on the Union side More than 90,000 Michigan men, nearly 23 per cent of the state's male population in 1860, served in the United States Civil War. Michigan supplied 31 infantry units, 11 cavalry units, 14 batteries of artillery one unit of engineers and one unit of sharp shooters. More than 90,000 Michigan men, nearly 23 per cent of the state's male population in 1860, served in the United States Civil War. Michigan supplied 31 infantry units, 11 cavalry units, 14 batteries of artillery one unit of engineers and one unit of sharp shooters. Charles M. Lum, Colonel, Detroit. Christopher J. Dickerson, Lieutenant Colonel, Hillsdale. James J. Scarrett, Major, Port Huron. James C. Willson, Surgeon, Flint. Franklin B. Galbraith, Assistant Surgeon, Lexington. Sylvester D. Cowles, Adjutant, Pontiac. Edwin A. Skinner, Quartermaster, Detroit. Jesse S. Boyden, Chaplain, Flint. Company A. Captain, Henry S. Burnett, Goodrich. First Lieutenant, Robert F. Gulick, Corunna. Second Lieutenant, Bradford Cook, Howell. Company B. Captain, Charles H. Richman, Saginaw City. First Lieutenant, Harvey Lyon, Midland City. Second Lieutenant, George Turner, Midland. Company C. Captain, Myron Bunnell, Goodrich. First Lieutenant, Benjamin B.Redfield, Orion. Second Lieutenant, Alva A. Collins, Orion. Company D. Captain, Israel Huckins, Lexington. First Lieutenant, Hannibal H. Nims, Lexington. Second Lieutenant, George W. Jenks, Lexington. Company E. Captain, William Hartsuff, Port Huron. First Lieutenant, Daniel Leach, China. Second Lieutenant, Ed F. Bunce, Port Huron. Company F. Captain, Walter P. Beach, Lapeer. First Lieutenant, Noah H. Hart, Lapeer. Second Lieutenant, Calvin M. Hall, Almont. Company G. Captain, Lafayette L. Deming, Jackson. First Lieutenant, William H. Dunphy, Memphis. Second Lieutenant, Hiram B. Pierson, Jackson. Company H. Captain, John Piersons, Pontiac. First Lieutenant, Sylvan Ter Bush, Pontiac. Second Lieutenant, Nathan Levy, Rochester, N. Y. Company I. Captain, Russell M. Barker, Flint. First Lieutenant, Platt S. Titus, Detroit. Second Lieutenant, John Algoe, Flint. Company K. Captain, Ethel Judd, North Adams. First Lieutenant, John T. Storer, Hillsdale. of short rations. The regiment was then assigned to the First Brigade, Second Division, Fourteenth Army Corps, Army of the Cumberland. enlisting the 6th of February, 1864, with the expectation of going home for a 30 days' furlough. While anticipating such a pleasant event orders were received for the regiment to move with the army in a general advance toward Dalton, Ga. At Buzzard's Roost, February 25, the enemy was found strongly fortified, and the Tenth was pushed forward upon the confederate works and met a storm of grape and canister, causing a loss of 13 killed, 35 wounded and 17 missing, a total loss of 65. The following month the regiment returned to Michigan, arriving at Detroit March 11, and was furloughed for 30 days. May 11 the Tenth was back in Chattanooga, and commenced the Georgia Campaign, marching by way of Dalton and Kennesaw Mountain, crossing the Chattahoochee River the 17th, and taking part in the siege of Atlanta. The Tenth was a part of General Sherman's army and participated in the march from "Atlanta to the Sea," and after a number of skirmishes with the enemy, arrived before Savannah December 11, and when that city fell the Tenth encamped there until January 20, 1865, when it started with the balance of the army on the Campaign of the Carolinas. The Tenth crossed the Savannah River at Sister's Ferry, Feb. 6, and was engaged with the enemy at Fayetteville, N. C., March 11, and crossed the Cape Fear river on the 12th. The regiment skirmished heavily with the enemy at Averysboro, N. C., the 16th, and fought a battle at Bentonville, the 19th. The Tenth then marched on Raleigh, and reached Goldsboro on the 23rd. The line of march was then continued to Richmond, Va., as that city had fallen into the hands of the Union troops at the surrender of General Lee. On the 10th of May, 1865, the regiment marched to Washington, D. C., where it took part in the grand review with General Sherman's army on the 24th. The regiment, then in command of Colonel Dunphy, started for Louisville, Ky., where it was mustered out of service July 19, 1865 and returned to Jackson, Mich., the 22d, and on the 1st of August was paid off and disbanded. Bentonville, N. C., March 19 and 20, 1865. Historical Data Systems, comp. U.S., American Civil War Regiments, 1861-1866 [database on-line]. Provo, UT, USA: Ancestry.com Operations Inc, 1999. Copyright 1997-2000 Historical Data Systems, Inc.; PO Box 35 Duxbury, MA 023.